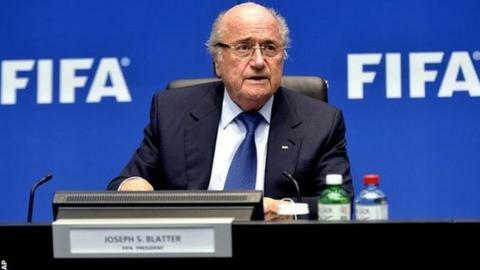 Fifa boss Sepp Blatter said the 2018 World Cup will go ahead in Russia, despite the nation annexing Crimea. Labour MP Andy Burnham earlier told BBC Sport: "The appeal is to Fifa to think again and to reconsider this decision." But asked about the issue on Friday, Blatter said: "The World Cup has been given and voted to Russia and we are going forward with our work." President Vladimir Putin signed a law on Friday formalising Russia's takeover of Crimea from Ukraine. Fresh sanctions have been imposed by the European Union and the United States, but Blatter dismissed suggestions that Russia's actions in Crimea could affect the 2018 tournament. Burnham, a former Secretary of State for Culture, Media and Sport, believes world football's governing body must act. "Russia can't have it both ways," he added. "They want to host major international sporting events and have the prestige and profile that comes from that, but then within days of the Sochi Olympics ending they were invading a neighbouring country and violating the sovereignty of the Ukraine. "Mr Putin is going to have to decide if he's a part of the international club and everything that brings with it, or is he going to go it alone? I just think it's time to stand up to him. "It would send a very clear message, wouldn't it, that the rest of the world considers this behaviour to be unacceptable." Fifa and Uefa also decided that club sides Tavriya Simferopol and FC Sevastopol should complete the season in the Ukraine Premier League - both have expressed interest in switching to the Russian league next season. Blatter was answering questions after he and other Fifa executive committee members were interviewed in Zurich as part of an investigation by ethics prosecutor Michael Garcia into the 2018 and 2022 World Cup bidding contests, won by Russia and Qatar. Asked about the Daily Telegraph investigation, published this week, into former Fifa executives Mohamed Bin Hammam and Jack Warner, Blatter added: "I'm happy now that we have an independent committee for ethics. This is a matter now to be dealt with by this committee."